We are considered in the market to be one of the leading manufacturers, exporters and suppliers of this impeccable range of Industrial Felts. The offered range is widely praised for its impeccable strength, finishing and dimensional accuracy. Felts are continously being accepted as bases in the furniture,tables, lamp and various other industries. Its attractive colours and ready to use rolls work out very cost effective to the user industry. Felts blocks finds their application in writing instruments, ink-pads, erasers, lining, underlay, door-mats, automobile carpets, die-cut part for lamp bases, furniture legs , base pad for ironing; dentistry, toys, educational kit, vegetation growth among ever growing applications. Felts due to its properties of elasticity ; absorption of the liquids and their release later on serves as an excellent reservoir for the thickest viscous liquids and has found large application as sealants in Railways, Kilns, electric motors for non-stop continuous working life. Its low frictional capabilities have made it popular in a large number of mechanical applications. Wool as a fiber has far better air permeability ratio vis-à-vis other synthetic fibers and hence finds uses in air filters for automobile, cement, ceramics and other industry. Diesel and other viscous hydrocarbon fluids are also best filtered through wool felt media due to its corresponding properties of heat resistance and filtration. 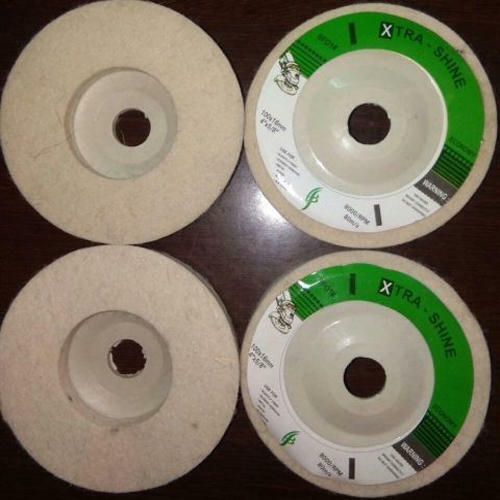 Due to its capability of high compactness, liquid absorption and higher product life, Molded Felt Wheels &l die-cut polishing wheels finding applications in the leather; jewelry, glass, dental, crystal, metal, Stone and other industries. Felt components used for various needs of wicking, fluid transfer, soundproofing, spacing, heat absorption, fluid reservoir conveyor belt for bakery industry. Self-adhesive felts in various thicknesses are being used to enhance the working life of the product.